R oxias Brown Elbuort stood next to his bed, gazing down at the pile of items he’d stacked on it. He’d always been something of a minimalist, so all his worldly possessions were currently on top of the straw mattress, but now, he had to leave behind most of even those meager belongings. He was a squire of Meridell, and thanks to a new law, he had to take a year-long pilgrimage before he could become a knight. And pilgrimage rules stated that he was allowed to start off with only three items, plus the clothes on his back and 3,000 Neopoints. Roxias knew what two of the items were going to be: his sword, which had belonged to his father and his grandfather before him, and his shield, which his mother had made when she became a knight herself. The third item was a more difficult decision. He could just bring an item of food, he supposed, but he could easily purchase that later on. The same went for potions or other battle or healing supplies. Perhaps he could bring a book, either from his shelf or from the Elbuort’s massive library, but how could he choose just ONE? Finally, he made his decision. He turned, and walked over to the wall to the right of his bed, where he removed a picture that showed much younger versions of himself, Dainileai, Jaylie, June, Rex, Wingreski, and Grandpa Tobi, standing in front of a Meridellian farmhouse with a massive Darigan skeith, a willowy blue aisha, and a blue lupess with braided brown hair, who was using one arm to draw Roxias close and the other to gesture at his new squire uniform. It was hard to say who looked more proud, the lupess or Roxias. Roxias stared at his younger self. A mere eleven years old at the time the photo was taken, the blue lupe still had some baby fat in his cheeks, but his body was awkwardly gangly due to the recent growth spurt he’d had. As a result, his squire tunic was too baggy around the belly, and a little too short in the arms. Younger Roxias didn’t seem to care; in fact, he didn’t appear to have a care in the world as he beamed at the camera. Next Roxias gazed at the lupess for a moment, his ears drooping slightly as he did. But then his ears, as well as his body, straightened up, and he carefully stowed the picture in the pocket of his tunic right over his heart. “I will make good, Mam. I promise,” he murmured, then he sheathed his sword, buckled his shield behind his back, and headed out of his room, pausing only to turn the lights off. When he came to the kitchen, intending to grab a quick bite to eat before he set off, he found his entire family waiting for him. That wouldn’t have been so much of a surprise- ever since his adoption, the Elbuorts had been nothing but friendly to him- had it not been for the fact that it was an hour before dawn. Even Wingreski, who normally didn’t stir before noon if he was able to help it, was present. None of them said anything for a moment. Then, Jaylie ran over and gave him a big hug. That was even more shocking than his family’s presence, since the human had been reluctant to give any sort of physical affection for the past three years. Avvie, Jiopuyd, Babbles, and Dainileai joined her, which wasn’t surprising at all, so Roxias had plenty of time to brace himself to keep from being bowled over by the children and the green mynci. “And I’m guessing King Skarl figures the more they know about other lands and their customs, the less the chances of them stealing ANOTHER sacred relic, cursing an entire land of Neopians and starting two wars with them in the process,” said Wingreski. “But you could still take us with you,” argued Avvie. “And we all count, except maybe Melvin. But for whatever reason, Roxias didn’t take to me suggestion to bring a half-crazy Swamp Ghoul along,” spoke up Arthena. “We all will,” said Jaylie. Avvie peered at him curiously, and nodded. The tiniest of giggles escaped Avvie as she nodded again. “They need someone to look after them. I was wondering if you’d like to be my replacement,” concluded Roxias. He headed up the staircase until he reached a trapdoor. When he went through it, he found that the trapdoor was actually the lid of a wooden chest, which Grandpa Tobi had enchanted to be like a mansion on the inside. The chest was in the village surrounding Meridell Castle, so it didn’t take long for Rex to find an eyrie taxi and set off for his first destination: Faerieland. His fellow squires would probably call him “unmanly” for choosing that location, but he hadn’t seen it since the Faeries’ Ruin, and wanted to know how much it had really changed. He supposed he could have used the new portal system, but if he was being honest, he wanted to sleep a bit more, and an eyrie taxi ride would give him at least a couple hours to rest. Roxias stayed awake just long enough to watch Meridell turn into a quilt of farms and villages far below him, then put his head against the side of the carriage and dozed off. Before the practice was banned in Year 17, faeries would loan Neopets cloud racers so that they could have their own cloud races. While everyone was welcome to WATCH the races, participating was a privilege that very few Neopets ever earned. Cloud racers could get up to well over a hundred miles per hour in speed, and races weren’t about how could go the fastest so much as who could go the longest without crashing into something, or getting trapped by their opponents; to be able to participate in the races, you had to be the right combination of fighter, pilot, and just plain crazy. One such combination was a yellow zafara named Scout. Roxias had scarcely set off for Faerieland when Scout woke up and started getting ready for a day of racing. Once she’d donned a brown fur-lined jacket and denim trousers, she plopped her blue fishing hat over her head, tucked a helmet with goggles under her arm, and left her family’s inn for the teleportation site. Accounting for the time it took to walk to the teleportation site, teleport, and walk to the edge of Faerieland where the Neopet cloud races took place, it took her ten minutes to reach her destination, a marked improvement over the three and a half hours it would have taken for an eyrie taxi to make it from Mystery Island to Faerieland. “If by ‘interesting’ ya mean ‘full of painful, agonizing failure,’” said Yule, smirking back. “Sure you didn’t,” muttered Scout. “Grampin and I once sailed The Nomad through a veritable minefield of jagged rocks while being chased by a pack of rabid jetsams in the middle of a hurricane. I can handle a trio of morons,” Scout replied. Yule managed a victory in her and Scout’s races, and might have managed two, had Scout not demonstrated why she was nicknamed “Waterjet” by suddenly putting her racer into top speed while keeping the exhaust on, causing the exhaust, normally a wall of bubbles, to turn into a long jet of water that sent Yule’s racer flying off the course when she hit it. The Christmas xweetok returned drenched, but laughing, and she promised to get Scout the next time. After the fourth round of races concluded, everyone took a short break. Scout and Yule decided to sit on the cliff while they drank some water. They looked down at Faerieland, which was slowly transforming into its usual hub of activity as the sun rose higher into the air. “Nimmos don’t have tails, but I’ll still try my best,” said Yule with a grin. They finished their water, then went back to their racers, ready to start the next round. About an hour later, Roxias was startled awake by an almost-deafening whoosh soaring past him. His instincts made him curl up on the floor, hands over his head, before he was fully conscious. When he realized that the sound was disappearing, he stood and walked to the window, and saw a Water Faerie and a Tooth Faerie cloud racer zooming off. He frowned when he realized that they bore a yellow zafara and a speckled kyrii. 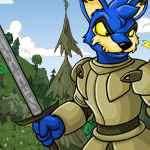 He opened the slot in the front of the carriage that would allow him to speak to the driver, and shouted, "Two Neopets are riding Faerie cloud racers! Is that legal?" The eyrie laughed. "You really don't get out much, do you? Yeah, the faeries need everyone they can helping out with rebuilding their land, not to mention keeping those blobby wraith things at bay, so for the past few years they've been letting Neopets do the cloud races in their place. They've got three sets of racers: morning, afternoon, and night. The ones who nearly bowled us over were the morning shift, and in between you and me, I think they're the craziest. They don't have to take as many breaks due to the heat of the day like the afternoon shift, and by the time the night shift gets here, they're too tired by their day jobs to really go all out. The morning shift's biggest problem is that they don't have as many fans 'cause not as many Neopets get up to watch their races from the beginning." Roxias looked at the cloud racers, and could just make out the Water Faerie racer making a near ninety-degree turn, causing it to tilt almost completely sideways. Judging by the rider's whoop of joy, they were more entertained than alarmed. He shook his head, "Maybe the parents are just too scared of what their kids might see." The taxi landed a moment later. Roxias tipped the grateful eyrie, then set off, trying not to gawk too much as he walked through the cobbled (not clouded!) streets of Faerieland. As he took everything in, he also went over his plan. He was headed for the Faerieland Employment Agency, where he would take on a few basic jobs till he reached his limit. Then he'd try his hand at the Faerie Caverns, and the various games that Faerieland had to offer. Hopefully he'd get enough Neopoints to spent the night at the Neolodge here; if not, camping supplies were cheap, so he'd make due outside till he could afford lodging. After he'd spent a few days here, he'd move on to another land, probably somewhere with a Battledome, where he KNEW he could make plenty of Neopoints. And so he'd spend the next year moving from land to land, taking on odd jobs or battling, but never staying in one place for more than a few weeks. The biggest wrench in his plan was transportation; even teleportation could grow costly, depending upon the land and how often one teleported. He'd have to plan out how long he stayed in one place very carefully, and always keep some Neopoints aside just in case. He reached the employment agency. He took a deep breath, then headed inside. It was time to see what a would-be knight could do to earn a living around here. The morning shift finally ended their races around 11:30, but the afternoon shift wasn't scheduled to even arrive till 12:30, in order to give the racers time to cool down. Once the drivers made sure their racers were refueled and, in some cases, cleaned, they headed off to lunch. Yule walked over to Scout, who had retrieved her blue fishing hat and was taking off her helmet. "Hey, Waterjet, Sparkling-Ice and Nightlight invited us to their family's restaurant. Their treat." Scout shook her head, both to give Yule her answer and to make her curly brown hair fall into place. "Maybe some other time." "That's what you say EVERY time. C'mon, Waterjet, it's FREE FOOD! What more could you ask for?" Scout pulled her hair into a bun, then plopped her fishing hat over her head. "Nothing's free. That food'd require me to talk to lots of people at once, and I'm not in the mood. Besides, I got the 10,000 Neopoint grand prize for winning the most races today, I've got more than enough to buy my own lunch. See you in a couple days." Yule frowned at the zafara as she walked off, but then shrugged and headed over to Nightlight and Sparkling-Ice. "Hey, more burgers for me." Scout's aunt never made lunch before noon, so Scout stopped by Faerie Foods for a snack. She exited a moment later with a crazy crisp taco, which she munched on as she headed for the teleportation site. She didn't seem to notice the six jetsams standing outside Faerie Foods, who leered at her as she walked past. "That her?" muttered a red jetsam. "Oh, yeah. Let's get her," said a blue jetsam. "You two, take that alleyway, and you two, go onto the parallel street. We're going to surround her and take her by surprise." The lupe reached for his sword, but quickly realized that they weren't aware of his presence. They were too busy following a yellow zafara in a blue fishing hat. With a start, he realized it was Scout Capernaum, the granddaughter of Grandpa Tobi's friend Max. There were no guards in sight, so Roxias, keeping a hand on his sword, began to follow the jetsams. If they thought they were going to claim another victim on his watch, they had another thing coming. She tried to shake them, but when she made her second left turn, she realized that it had been a mistake. Two jetsams stood waiting for her, and when she turned around, the other four had found her and were closing in. They had her surrounded. Scout doubled over laughing. The jetsams exchanged a look of surprise. "You do realize how much trouble you're in, right? Why are you laughing?" demanded the blue jetsam. Scout slowly straightened up, wiping tears of mirth from her eyes. "I'm sorry, I'm sorry, I just...you think I'M in trouble? Oh, man, you've got no idea who you're dealing with, do you?" "Lila "Scout" Capernaum. Granddaughter of Max Capernaum, member of the Golden Quartet, world-renowned explorer and cartographer. Yeah, yeah, your grandpa was real impressive, we get it. Till that Scabeye fella came along," said the blue jetsam. Scout scowled. "Scabeye was a coward who Grampin could've taken down with his PINKY in a fair fight, if Scabeye had had any concept of the word 'fair.' But my heritage's not the reason you should be afraid of me, I am." It was the blue jetsam's turn to laugh. "You've got no weapon, no one to help you, and we've got you surrounded on every side." "Yeah, poor you," Scout replied with a grin. With that, the fight began. The jetsams were good, but Scout was better. Soon the blue jetsam was the only one left standing. Scout's grin widened as they circled each other. "Last chance to surrender." "I don't think so. We got paid to keep you outta the way for the next three days, and that's what we're gonna do!" growled the jetsam. He whistled, and suddenly, twelve new jetsams swarmed up and surrounded Scout. "'Course, our client never said we had to take you with all your bones intact!" With no warning, a second-story window in one of the surrounding buildings burst open, and out leaped a blue lupe, who landed right next to Scout. The lupe had his shield out, but made no move to draw his sword as he growled, "You know, where I'm from, that's considered no way to speak to a lady!" Scout's eyebrows shot up. "Okay, one, who are you, and two, what in the name of FYORA makes you think I'm a LADY?" The blue jetsam smirked. "Well, well, lookit what we got here, boys. Rocky Elbuort." "It's ROXIAS! And I suggest you stand down, now!" snapped Roxias. "Before I-"
"Wait, an ELBUORT? Oh, great, you're that grandkid of Grandpa Tobi's, that Jeran wanna-be!" groaned Scout. "Just what I need, some guy who thinks me a damsel in distress and himself my knight in shining armor!" Roxias stared at her in disbelief. "Wait, when did I ever say I think you're just a damsel in distress? I saw you with those other jetsams, I know you're a great fighter, but-"
"But what? You think I can't handle these idiots, too?!" "Maybe if there were less of them, but thirteen, and you've already taken down five?! What's wrong with me helping you even the odds a little bit?!" "What's WRONG is that I never ASKED you to!" "Oh, I'm sorry, I didn't realize I needed PERMISSION to save lives now!" "MY life, you do! Why don't you run back to Meridell and use that fancy sword of yours to slice some poor innocent cabbages sacrificed for one of Skarl's tourneys, that's probably all you're good for anyway, that and being a danger magnet like the rest of your family!" The Jetsam Thieves had been watching the two argue like a game of Mynci Beach Volleyball, their heads snapping from Roxias to Scout. Finally the blue jetsam growled, "You morons can settle this later, seeing's how I just decided we'll take Roxanne too! His family's loaded, they'd pay handsomely to get him back! ATTACK!" The jetsams charged, and for the next couple minutes Scout and Roxias were too busy fending off attackers to argue. Finally the blue jetsam was the last one standing, and this time, he had no backup to whistle for. He took one look at the yellow zafara and blue lupe advancing towards him, and ran off. "That's easily the smartest decision you've ever made!" Scout called after him. She whirled on Roxias, her hands on her hips. "Fine, so you're not COMPLETELY useless. But maybe next time make SURE I can't handle something before you just barge in like that." Roxias glared at her. "How, by waiting till they had a dagger against your throat?" "Maybe! And why didn't you draw that sword? What, are you afraid it'll turn your fur green if you hold it too much?" "You don't roll a cheese with a tree when a stick will suffice. At least I had a weapon if I needed it!" "I've been trained in martial arts my entire life! My whole BODY is a weapon! Without that sword and shield, you'd be as useful as a swimsuit store on Terror Mountain!" snarled Scout. She turned, and stormed off, shouting over her shoulder, "Thanks for the rescue!" "You're welcome!" Roxias shouted back. He put his shield away, and muttered, "I can see why her aunt never brings her along on visits anymore. Now, to find some camping supplies..."
Scout had almost made it to the teleportation site when she saw Roxias attempting to haggle with an Earth faerie over a tent and a camping bed. "1,500 and that's my final offer!" exclaimed the faerie. "I only HAVE 1,500. I'm begging you, lower the price just a little more!" Scout marched over. "Oy, Chivalry Boy!" Roxias looked up, surprised. Scout glowered at him, "You mean to tell me you can't afford anything better than the great outdoors or one of those roach-infested rooms in the Neolodge? What about that fancy-shmancy mansion-in-a-box your family owns?" "I can't go back to them, I'm on a pilgrimage. It's the last step I have to take before I graduate from squire to knight," explained Roxias. Scout groaned, and pinched the bridge of her nose. After a moment she grabbed Roxias's arm, and dragged him with her as she stormed off. Roxias was too shocked to resist. "Where are we going?!" "Aunt Mo will have my head if she finds out I let one of Tobi's brood spend the night in some leaky old tent!" the zafara retorted. "Now come on, lunch starts in five minutes!" Authors Note: This is meant to serve as the first chronological story in the "Travels Of A Would-Be Knight" series I wrote a few years ago. As such, it is set in Year 14, as are all other "Travels of A Would-Be Knight" stories unless specifically stated otherwise.